replacement seat designed to fit most bikes with impressive ease. - Comes with a BONUS saddle adapter to fit even more types of bikes. - Has detailed mounting instructions and tools for simple installation. - Dual shock absorbing springs. - Made with premium materials and strong stitching for enhanced durability. - ISO-certified for meeting international bike safety standards. Ride longer and work out harder with this extra-comfy replacement bike seat. DESIGNED FOR EXTRA COMFORT: Unlike other bike saddles that are too thin, too narrow, and a pain over rough ground, our oversize replacement bicycle seat is extra wide, has more padding, and comes with dual-spring suspension for an impressively comfy ride for both men and women. UNIVERSAL FIT: No more getting stuck with an ill-fitting replacement bike seat. We've designed ours with a universal rail mounting system and included a BONUS saddle adapter. This also makes a great bike saddle for your stationary exercise bike or your outdoor cruiser, touring, or mountain bike. ISO CERTIFIED QUALITY: Premium materials meet detail-oriented workmanship to create a heavy-duty bicycle seat that lasts. You'll love the high-quality padding that never loses its bounce like others do and the silence of the shock-absorbing springs. SIMPLE TO INSTALL: You'll have this outdoor/spin bike seat replacement up and ready in no time. It comes with easy-to-follow mounting instructions for a no-hassle installation. Don't have any tools with you? No problem. We've included all the mounting tools required right in the box. LIFETIME WARRANTY: You have nothing to lose. 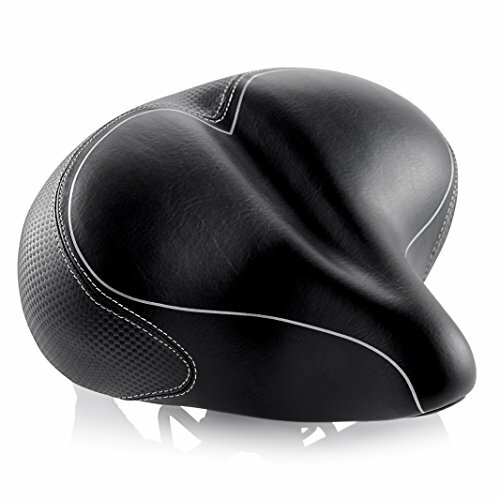 Our bicycle seat cushion saddle is backed by a one-of-a-kind lifetime warranty. Experience any issues with it? We'll quickly send you a replacement. Make bike riding supremely comfy completely risk-free!